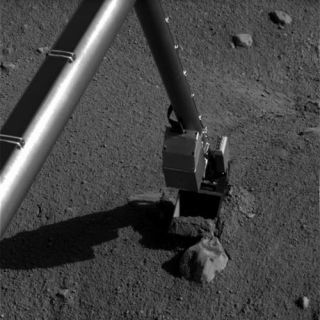 NASA's Phoenix Mars Lander's Robotic Arm comes into contact with a rock informally named "Alice" near the "Snow White" trench. This image was taken by the lander's Surface Stereo Imager on July 13. NASA'sPhoenix Mars Lander used its robotic arm to expose more of the hard icy layerjust below the Martian surface so that it can more easily gather a sample ofthe material for analysis. The trench,informally called "SnowWhite," was about 8 by 12 inches (20 by 30 centimeters) after diggingby the arm Saturday. Mission controllers sent commands to the spacecraft Mondayto further extend the length of the trench by about 6 inches (15 centimeters). Scientistssaid tests in a lab on Earth suggested more area must be exposed in order tocollect a proper sample. "Rightnow, there is not enough real estate of dark icy soil in the trench to do asample acquisition test and later a full-up acquisition" for the Thermaland Evolved-Gas Analyzer (TEGA), said Ray Arvidson, Phoenix's "digczar," from Washington University in St. Louis. The TEGA instrument bakessamples of the Martian dirt in tiny ovens and analyzes the vapors given off todetermine the composition of the regolith. The plan togather a sample of the rock-hard ice involves using the robotic arm's rasp tokick the icy soil into the scoop through a special capture mechanism.Scientists also want to scoop up any loose material left in the trench afterthe rasping activity, Arvidson said. The rasphas already been used to scrap the exposed icy layer, though those samples werenot analyzed. Samples of the shallower, non-icy soil from the Snow White trenchthough have been examined by Phoenix's wet chemistry laboratory and opticalmicroscope.? Last week, the lander stuckits fork-like probe into nearby dirt to see how well it conductselectricity and heat. "The Phoenix science team is working diligently to analyze the results of the tests from thesevarious instruments," said Phoenix principal investigator Peter Smith ofThe University of Arizona. "The preliminary signatures we are seeing areintriguing. Before we release results, we want to verify that ourinterpretations are correct by conducting laboratory tests." As therobotic arm was extracting the fork probe from the soil on Saturday, it cameinto contact with a rock called Alice near the trench. The arm isprogrammed to stop moving when it encounters an obstacle. Commandssent to the lander Monday told it to move its arm away from the rock, dump outsoil that is in the scoop and extend the Snow White trench toward the lander.